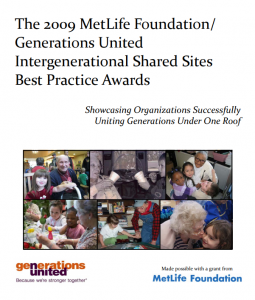 Although intergenerational shared sites typically serve participants that are under the age of 12 and over the age of 50, there are also programs that serve middle school, high school and even college‐age youth and young adults. Shared sites can serve participants with all levels of physical and mental abilities including older adults with dementia, and children and adults with disabilities. Age and Page 6 developmentally appropriate activities with specific goals can be developed accordingly to accommodate the abilities and needs of the participants. Now, with the current economic crisis, many communities face diminishing local, state, and federal dollars for construction and rehabilitation of facilities. In addition, current trends are for private sources to provide less funding for daily operations. Consequently, this limits the number of staff persons that can be maintained. The use of common space, shared equipment, cross-trained staff, and volunteers make common sense. Recent research published by Generations United found that intergenerational sites that shared expenses experienced significant cost savings over those programs that do not integrate expenses. There was great cost savings in the areas of personnel and rent which were by far the largest budget items for these programs.